In the depths of silence, where there is no where else to run, we come face to face with God. Have you experienced God’s presence in that way? So often, we fill our lives with noise – busyness and tasks and sights and sounds – noise. When I strive to remove the noise and rest in silence I find my true self – and there I find God already at work. As believers we know with our heads that God is present but too often we fill our lives with noise and fail to truly experience intimate relations with God. Find time and space to rest in silence today. God is already there – waiting for you. I was reminded, yet again, yesterday of the frailty of life. We get up every day and go about our daily tasks and To Do lists without a second thought. But the reality is that none of is guaranteed another day. Over the weekend, a dear friend and 1st B family member passed away at too young of an age. Eric was one of those guys who everyone liked. He had a smile that made others smile and a personality that made us smile as well. He went to bed in Littlefield, Texas on Saturday night and woke up in the very presence of God. I am sure he had no idea when his head hit the pillow that he would wake up in another place, but that is what he experienced. When something like this happens, it forces us to reexamine our own mortality and think about life as a frail gift. None of us know what tomorrow will bring – but we can see what today holds. What will you do with your today to make it count? How Important Is Your Bible? Yesterday, I read an online devotional, Lead Like Jesus, that I receive daily. Psalm 19:7-8 was included in the post. The text is a beautiful description of the importance of God’s word and how it is crucial to our existence. The writer of the Psalm obviously understood the importance of scripture. I have to admit, that question has haunted me since. The right answer is that my world would be totally changed. But my fear is the more real answer for my life, and many others, is that it might not look all that different. I have multiple Bibles on my shelves. I even have two on my phone. But when I read that question, I had to do some soul searching as to how much time do I actually spend pouring over scripture and letting it pour over me? Sure, I spend time in sermon preparation and that involves studying specific passages for my talk. But what about for me personally? I do spend time daily reading, or at least listening to scripture. But this question has caused me to rethink my commitment level. What has it done to you? Have you ever been around someone who just makes you feel good? Maybe they listen to your frustrations with a smile. Or maybe they offer a kind word when you are stressed or down. I have the blessing of having several people in my life who go out of their way to encourage and support those they meet. I think all of us, if we stop and think about it, can think of someone who is an encourager. What would your life be like without that person around? Take a minute to stop and pray for that person (or those persons) right now. Ask God to bless them and lift them up. Now, take another minute to reach out to them and encourage them today. What Sacrifice Will You Bring Today? Over the last two weeks, our sanctuary has been either too hot or too cold. Two weeks ago, we had no air conditioning. Yesterday, we had plenty. In fact, it was almost cold. 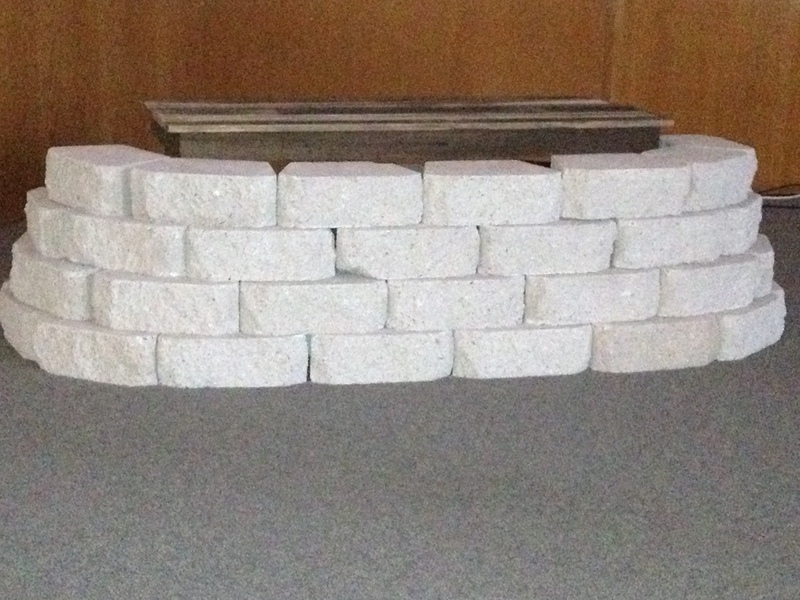 I had one person suggest we build a fire on the stage around the “campfire” I had built for the sermon. Now, I agree it was cool but I had to take offense at the thought that the altar I had so meticulously put together would be mistaken for a campfire. OK, I admit, it doesn’t look much like an altar. It looked very different in my head when I picked up the stones at Home Depot. At any rate, we had an altar on the stage yesterday. And the reason was to illustrate the sacrifice God expects of us. In Romans, Paul tells us that the sacrifice that pleases God is not our job, our money or even our family. The only acceptable sacrifice is the complete surrender of ourselves. Paul also points out that while in the Jewish sacrificial system, the sacrifice was killed as part of the ritual, God wants us to be a living sacrifice. We must die to ourselves so that we can truly live as God created us to live. As I crawled onto that altar yesterday to illustrate what we must do, I also made the point that the biggest problem with a living sacrifice is that it can crawl off the altar just as easily as it crawled on. Offering ourselves as a living sacrifice is a daily act of worship. It takes commitment – every day. Will you offer yourself today as a living sacrifice to God. How will you live today to show God your heart-felt worship? This coming Sunday is National Back To Church Sunday. It is a day set aside for folks who have never tried church. The hope is that if a person would just try it, he or she would see the importance. It is also a day to reach out to those folks who grew up going to church and have fallen away. The reality is, it is a day to remind those of us who are in church regularly that we have a calling to reach out to those who need hope. Yes, we show funny videos and we mail out cards and we expend all this effort to make it a big day; but nothing happens without our church folks getting out and inviting people to come. Without that, it is just going to be a Sunday like all the others. So this week, pray about what God might lead you to do in your own community. If you aren’t tied to a church – find one. Scripture is clear that the body of Christ should be in unity and should not stop coming together. If you are looking for the perfect church . . . I don’t think you will ever find it – and I know for a fact, you won’t find it at 1st B here in Littlefield. But what you will find at most churches – particularly ours – is a group of genuine folks who are learning to love God and trying to love others. If you are around Littlefield, Texas, at 10:30 on Sunday, come check it out. But, if you are already a part of a church – get involved there. God calls each of us to a particular place of service. Yours is at your church. Plug in and make a difference.